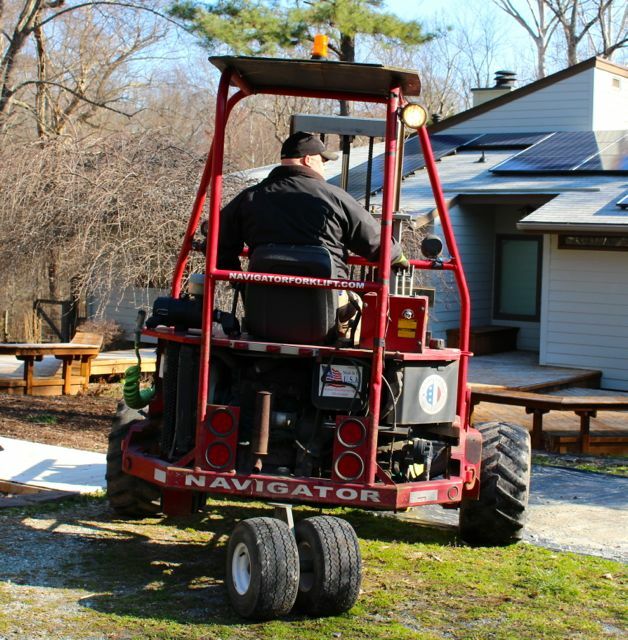 I’ve been blogging about gardening in the piedmont region of North Carolina since 2011. Occasionally, companies that provide gardening-related products contact me asking me to try their product and write about my results. I’ve done this for a number of years for seeds from Renee’s Garden, because they send me a number of seed packets for free to try. You can find my reviews by searching on the company name in my blog. Soil3 is 100% organic compost comprised of grass clippings from our sod farm, wheat straw from our farm, and cow manure from a local dairy. We compost using a high heat method (160º) and add mycorrhizea. 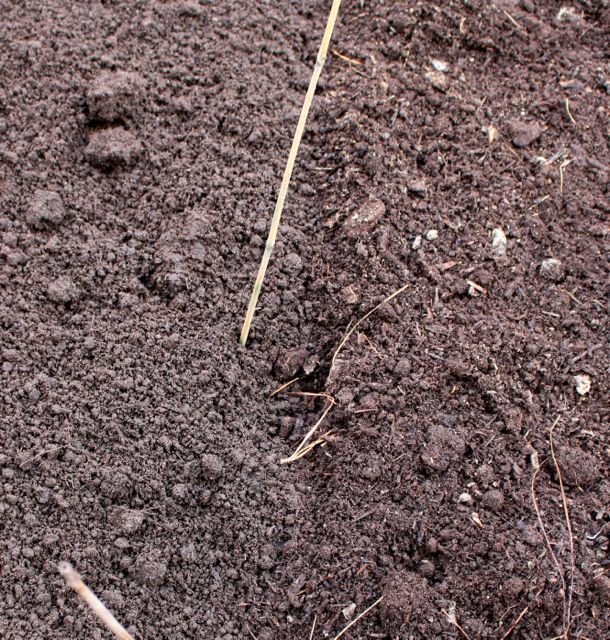 Beneficial microorganisms naturally colonize the compost as part of the process. You can learn more about this product here. Their representative offered me a free bag of this compost (thanks, Shannon!) if I would try it and write about it, and they would deliver it to my door. Well what gardener turns down free organic compost? The folks at Super Sod, like all companies that ask me to review their products, understood that my review would be based only on my results, not on how nice I thought they were to offer me this opportunity. 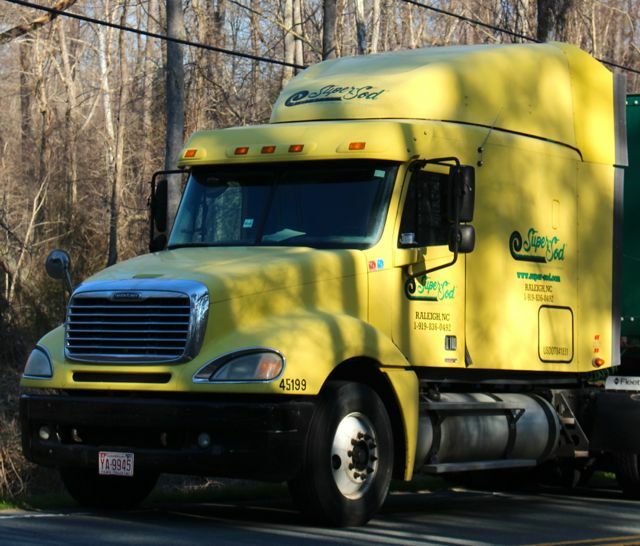 On the agreed upon delivery date last March 8, I was surprised to discover a massive yellow semi parked on the road in front of my house. I had not realized a giant truck would deliver my sample compost! I think this is the truck that is also used to deliver sod, which always comes in big sheets, so it made sense after I thought about it. It was certainly a happy bright yellow, just like the color of the bag of compost. I don’t know what you call the machine hooked up to the back of the truck that is used to deliver the compost, but soon the driver had it zipping down my driveway holding the bag of compost on the front prongs that probably also hold sheets of sod. I had intended for the bag to be deposited just beside the gate to my vegetable garden, but the delivery machine was too wide to maneuver there. So we went with Plan B and had the driver deposit the bag at the end of our driveway beside the walk to my house. It wasn’t optimal, but it was the best we could do. The bag is on the prongs in front of the machine, which he is maneuvering into place. I couldn’t get too close for photos. He was moving fast, and the machine was too noisy for me to be heard, so I stayed out of the way. 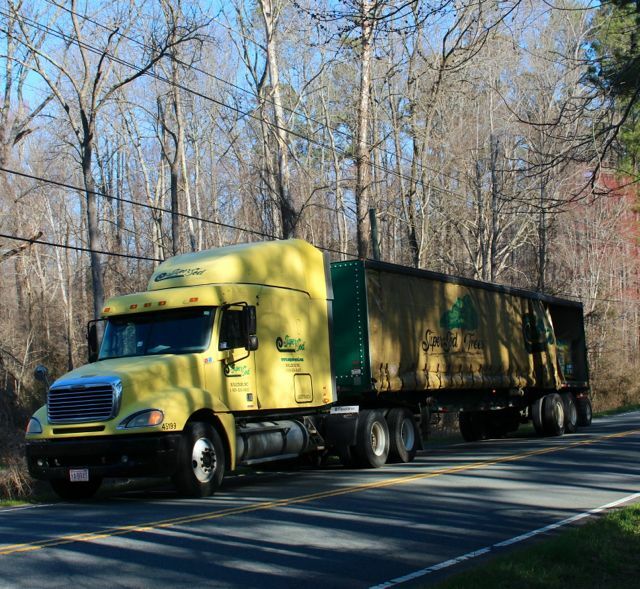 As soon as he had dropped the bag, the driver zipped back down the driveway and drove off in the semi. Heading back to the bright yellow semi. I was left with a bright yellow bag of compost — a cubic yard of it! The web site says it weighs about 1200 pounds, and I believe it. That bag was not going anywhere, which meant we had to offload the compost shovelful by shovelful into our wheelbarrow, then move the loaded wheelbarrow to the garden. It would have been much easier if we had been able to deposit the bag by the gate as we had hoped. But, hey, it was free compost. And, truthfully, when we get a dump-truck load of compost delivered from a local supplier, the pile isn’t any closer to the garden. I knew that this bag would not be enough for all my garden beds, so we ordered half a dump-truck load of compost from our local supplier too. I had always intended to do a side-by-side comparison of the Soil3 compost with that made and delivered by our usual supplier. I encountered one problem as soon as I tried to use the Soil3 compost the first time. The bag is almost taller than I am. 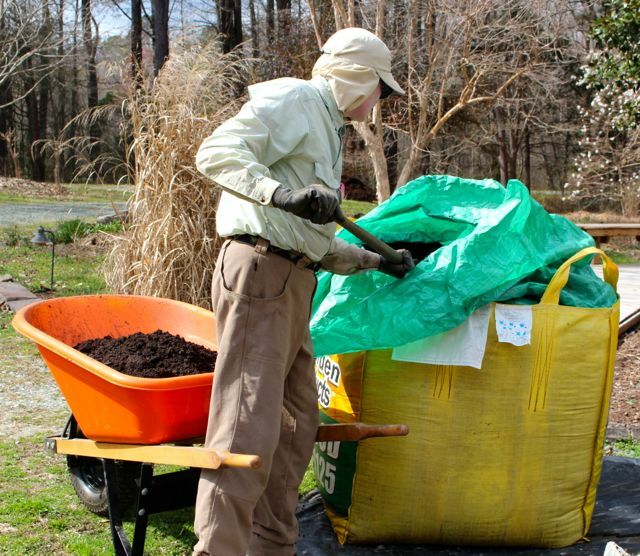 When I untied the inner green bag to get to the compost, the compost level was about up to my elbows. I was not tall enough to maneuver my shovel into the bag, lift out a shovelful of compost, and deposit it into the wheelbarrow. My solution? Wonder Spouse, of course! A tall, strong gardening companion and all-around great guy — Wonder Spouse! Our plan was to plant identical spring greens — lettuces, spinaches, and Asian greens — on two sides of one of our long vegetable beds. We mixed in Soil3 compost on one side, and the local compost on the other. Then I transplanted the greens, and we mulched them with a bit more of their respective composts. Before tilling in. Soil3 compost is on the left side of the stake. It’s a little hard to see in the above photo, but the Soil3 compost was a bit darker, and it tended to clump into tiny balls. It was less friable than the local compost, possibly because it was quite soggy when it was delivered. Liquid oozed out of the bottom of the bag for weeks after delivery. After tilling. Soil3 side is on the right side here. After tilling, the little balls of Soil3 compost broke up, so the soil on that side ended up being of a slightly finer texture that the side with local compost. And it was just a shade darker. We added metal hoops to support the garden cloth fabric we use to protect the greens from spring frosts, and the bed was ready for planting. The Soil3 side is on the right. As usual, I started my greens in my little greenhouse. I transplanted them into their compost-enhanced bed just after the middle of March. Here they are on March 28 after about a week in the bed. 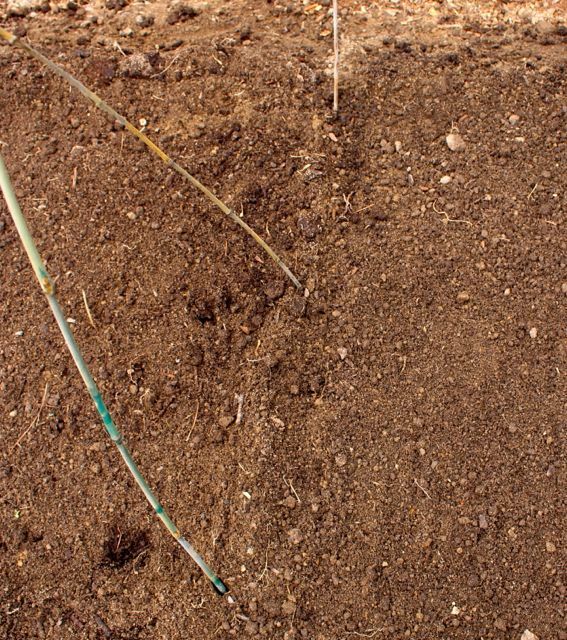 As you can see, at this stage, both sides (Soil3 in left photo) — which were planted with exactly the same varieties — looked indistinguishable. 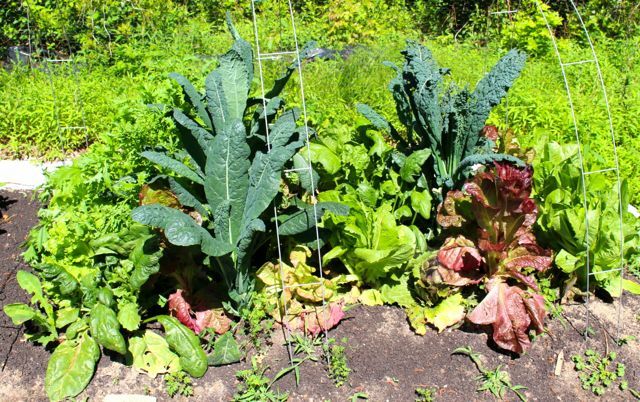 I got busy with all the other vegetables — and my new pollinator garden — and didn’t take any more side-by-side shots until the greens bolted in May, but I did pay close attention when I harvested and ate the greens. Neither Wonder Spouse nor I could discern any differences in growth rate or flavor, and both sides bolted from early summer heat at the same time. 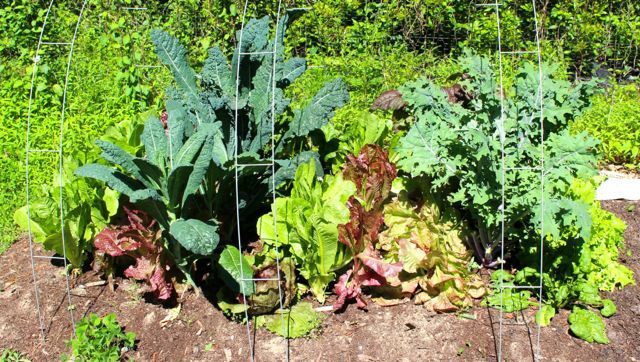 I’ve always used local compost to mulch my vegetables, and it has worked wonderfully, suppressing weeds, and continuously but slowly adding nutrients to the soil throughout the growing season. But the Soil3 compost didn’t work well that way. It created a hard crust that actually would create cracks as it dried out. Bolted greens on the Soil3 side. Bolted greens on the local compost side. By May 15, the spring greens on both sides of the bed were bolted and bitter. Plant sizes were indistinguishable by my admittedly unscientific analysis. We also created comparison beds for tomatoes and peppers. One bed of each vegetable type was mulched with one of the two composts. Again, we discerned no differences in productivity, disease resistance, flavor, etc. And as with the greens, the Soil3 compost tended to clump and crack to the point of reducing its usability. Eventually, Wonder Spouse had used enough of the bag so that I could now reach down with a shovel and fill my own wheelbarrow with loads of Soil3 compost. The closer to the bottom of the bag we got, the wetter was the compost, even though we diligently retied the top of the bag after every use. We even tried putting a plastic sheet over the bag to keep out more rain, but the Soil3 compost at the bottom of the bag never dried out, eventually become rather cement-like. We still have several inches of it in the bottom of the bag. We plan to move it somewhere and dump it out, hoping that if it is out of the bag, it might break down into something usable again. 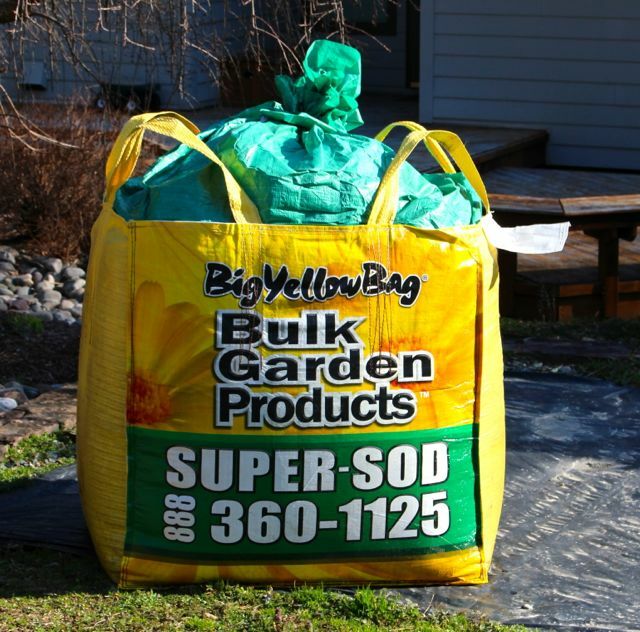 When the delivery man dropped off my bright yellow bag, he told me that many of their customers apply it as lawn fertilizer. I can see how that might work, if you have some mechanism for applying it evenly. But a 1200-pound bag of compost requires heavy machinery to manage. I kind of doubt typical homeowners like me would be able to devise any better way of dealing with this than I did. To summarize my test results, I would say that Soil3 is no better or worse than the local compost I usually buy, in terms of vegetable productivity. In terms of usability, the Soil3 compost is more difficult to use than the local product in two ways. First, just getting the compost out of the bag and into the wheelbarrow is remarkably difficult for anyone under 5’10”. And second, the texture of Soil3 is much harder to work with, tending to become cement-like when exposed to drying. My conclusion: Soil3 is expensive — at least by my modest standards. Given that the product was harder to use and we could discern no differences in crop productivity between it and our local compost, I would not buy this product for my garden. 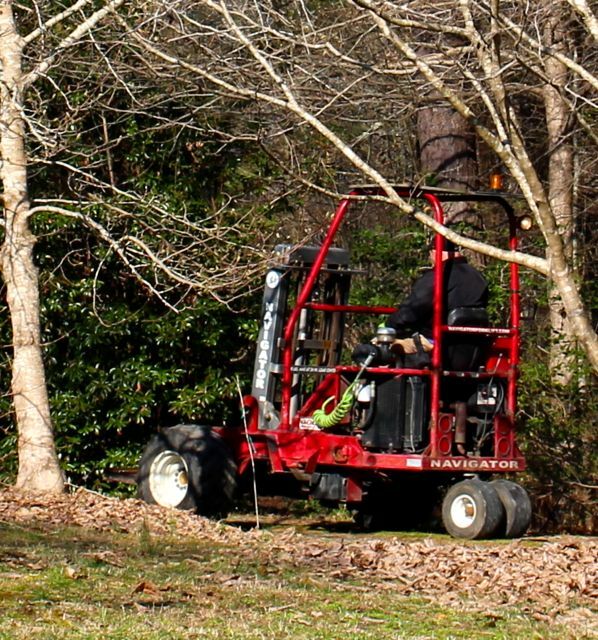 For larger horticultural operations with access to heavy machinery, it is possible that this product would be worth the investment. Thanks again to Super Sod, maker of Soil3, for the opportunity to try this product.